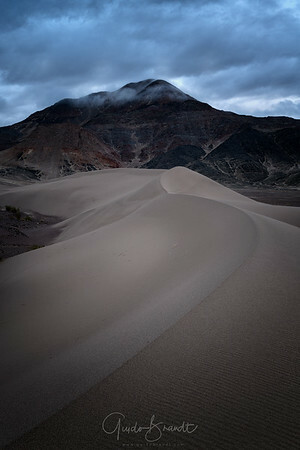 My good buddy Ryan Buchanan and I met a few weeks back in Death Valley National Park for an awesome photo weekend. 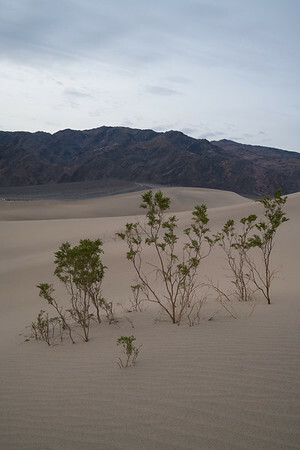 It was my second time in Death Valley, so there was still plenty to explore, in particular my favorite area - the dunes! 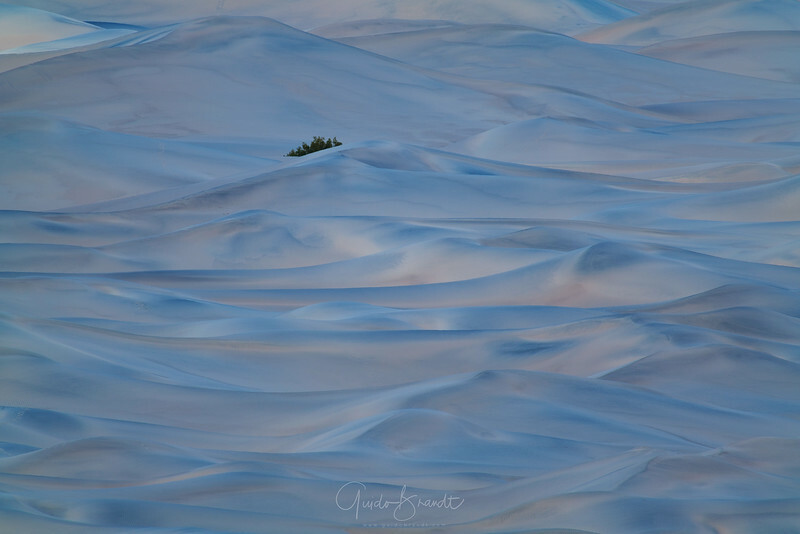 We had used the late afternoon to scout a number of compositions, I had settled on this one, Ryan was a few dunes further north. Waiting for the light I had decided to compliment the composition with the 'famous' sunstar generated by the Canon 16-35, one of my favorite lenses. 10 months ago I had dropped it out my camera bag while on a trip in Glacier National Park and it snapped right of the camera in half, heavily missed for the remainder of the trip. Luckily the excellent crew at Canon brought it back o life, so I could produce this image. It still seems to work alright!! I hope you enjoy! 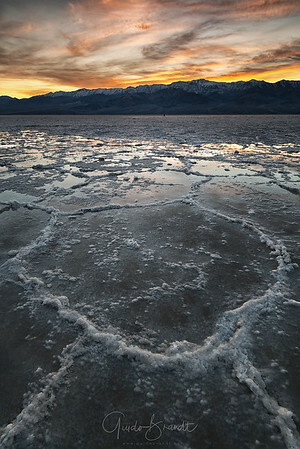 Badwater Basin is such a vast spot with plenty of exploration required. During the first afternoon of my visit I ventured out what I thought was plenty of time before sunset, but it turned out not sufficient. As the sky turned into the most amazing sunset colors, I still hadn't found my ideal composition. 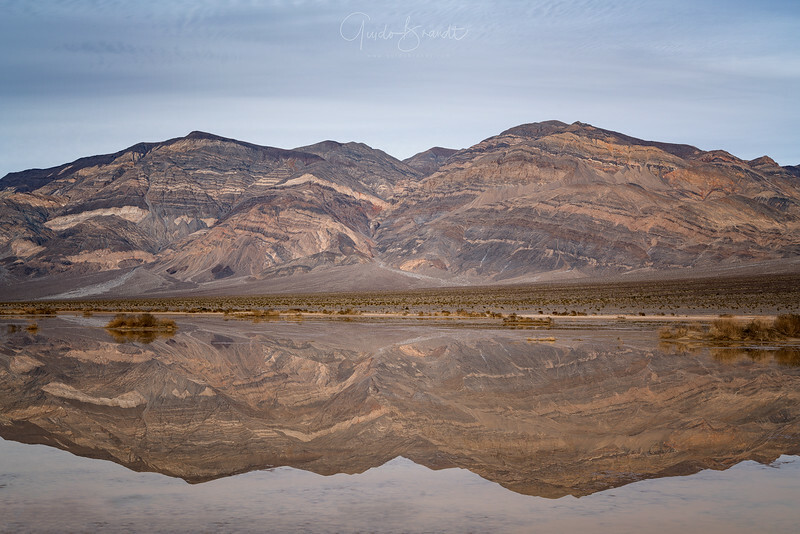 Badwater Basin was slightly flooded with surface levels of water and it was something I hadn't expected and had a hard time of integrating into my foreground compositions. In hindsight, I was probably too set on a preconceived idea. Slowly I am processing my images from my trip through the SW of USA. 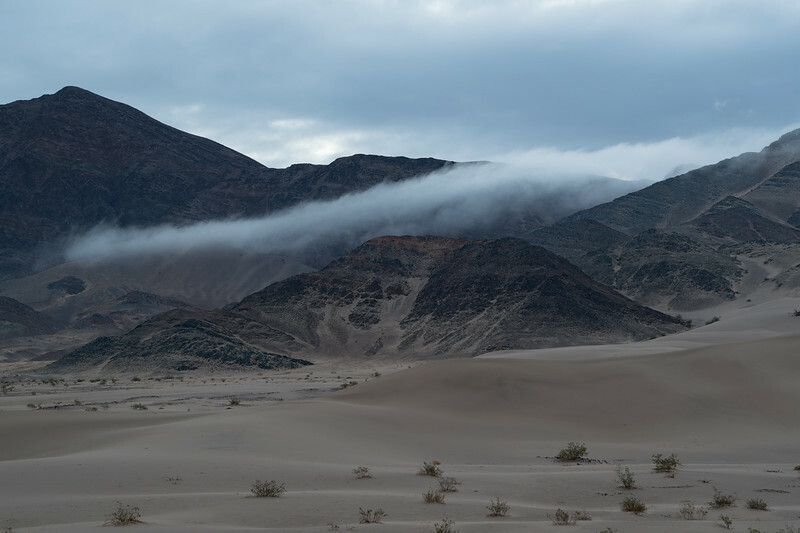 I absolutely loved the deserts of the SW and had a great time in Death Valley. 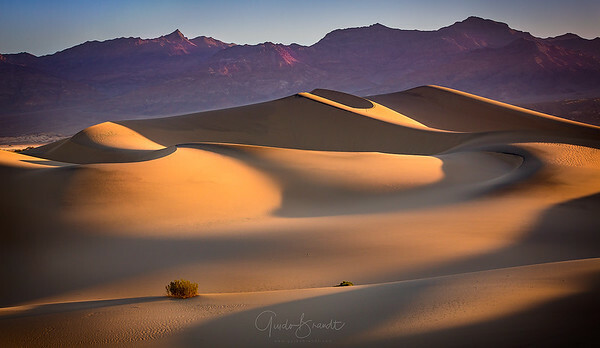 Shooting the Mesquite Flat sand dunes was lots of fun even if it was quite exhausting to climb dune after dune to find the perfect one! 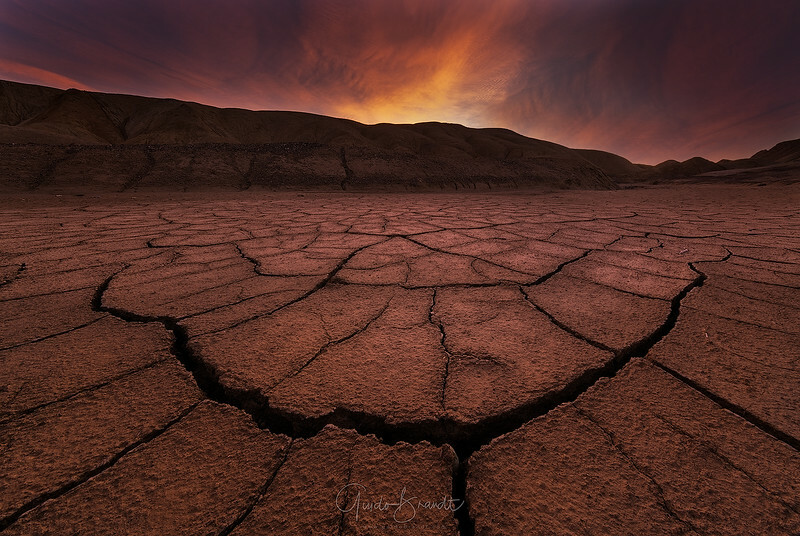 A year ago fellow photographer David Thompson told me that I would likely be able to find mudcracks at this location in Death Valley. After shooting sunrise at a different location I scouted this area and found a number of good spots. 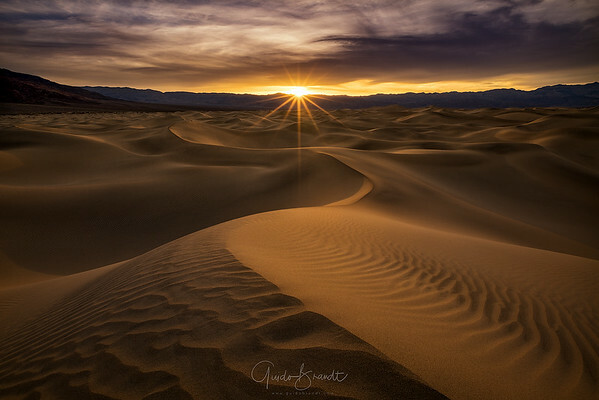 A year later, I dedicated sunrise at this location and searched in twilight to see if the mudcracks were still there. I found this location and looked for a nice looking one in the direction of the sunrise. This is taken with an ultrawide angle lens, so I am only a few centimeters away from these mudcracks. I hope you enjoy.